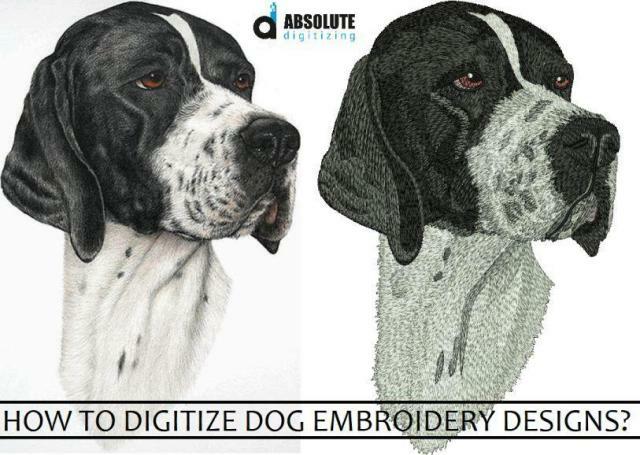 The most taxing and creative task in digitizing for embroidery is to create a realistic design of dogs. The design needs to have the life, feel, emotions and illusion of movement of a real dog just like a good animal painting. It must not appear like a lifeless caricature of the real animal. It takes immense precision, practice and above all knowledge of the process to bring life into the design. The most crucial part is to get that cute fuzzy fur right and design it into the realistic layers. 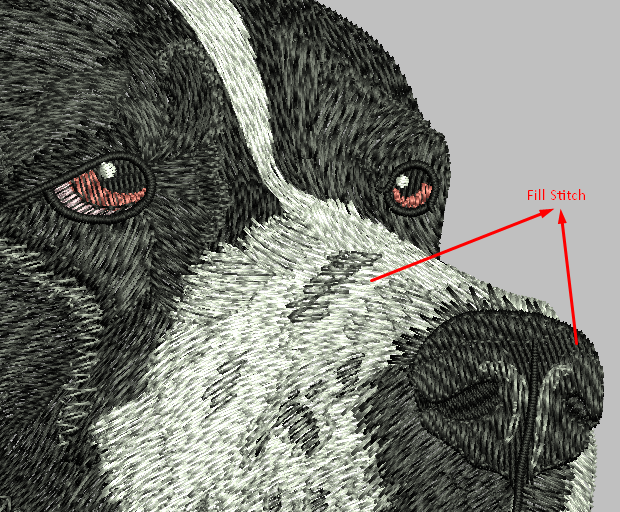 Here, we will share with you the secret tips behind our best selling skill i.e custom embroidery digitizing of a real dog photo. By the end of this blog, you will be well versed in the facts and details about the art of digitizing that perfect fur, muscles, and face from the photo of your pet ready for machine embroidery. So, here are the tips and tricks for converting you favorite animal photo into digitizing for embroidery. Embroidery Digitizing is based on the clarity and quality of an image. This image could either be a drawing or a photograph. Now, here is an important decision which will create the right base for digitizing a real dog. We would advise you to use a real photograph. 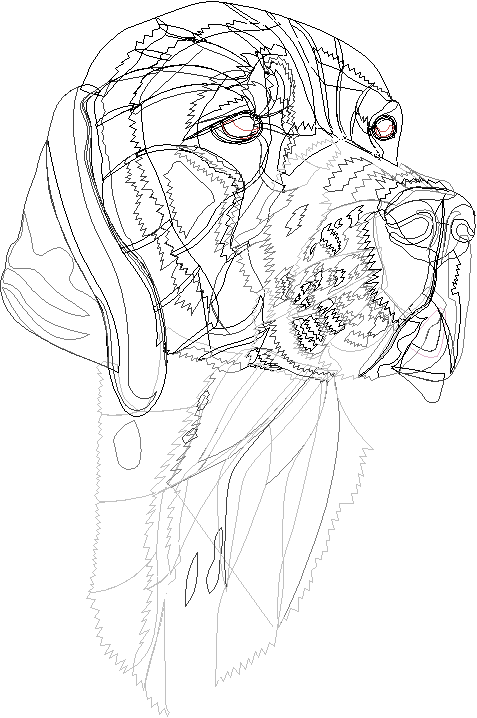 The photo should be clear in high resolution and must be highlighting the details of the pose of your dog which you would like to get embroidered. A clear crisp picture is significant as it will facilitate a digitizer to work on all the difficult areas. The usual practice in this industry is to follow the picture of the dog after starting the digitizing task. But this is a complete NO! It would affect your judgment of the details and would change the result completely. We recommend you to keenly observe the picture and pin the difficult areas in your mind firstly. The best track is the old school way of visualizing the image of that dog breed in your mind and holding the actual print of the picture in your hand while digitizing for embroidery. It would minimize the chances of apparently simple yet practically grave mistakes which most embroidery digitizers overlook. The designs you will deal with will be of two kinds and sizes: Small and Big. Smaller ones are trickier. In small designs, you have to keep in evade the extremely tiny details due to space constraints. While omitting them you have to identify the vital features and use them to make your dog look realistic and alive. Woof Woof! The bigger size designs pose different problems. Here, the structure should be proportionate or the design will turn out bland. The direction of hair and muscle structure is the key to blowing life into your sew out so you must study them carefully. Now, we will tell you how to perfectly do digitizing for hair direction and muscle structure. We would recommend creating a bright colored outline to keep the hair in right directions. The colors should be bright as it would not let you mix up the inner shades and outline. It’s like mapping out the directions. Digitizing of real animals only looks natural and alive with using more colors but using diverse colors require great expertise and skills. Unless you are creative and expert enough, you should stick to using two basic shades: lighter and darker to achieve the required result. 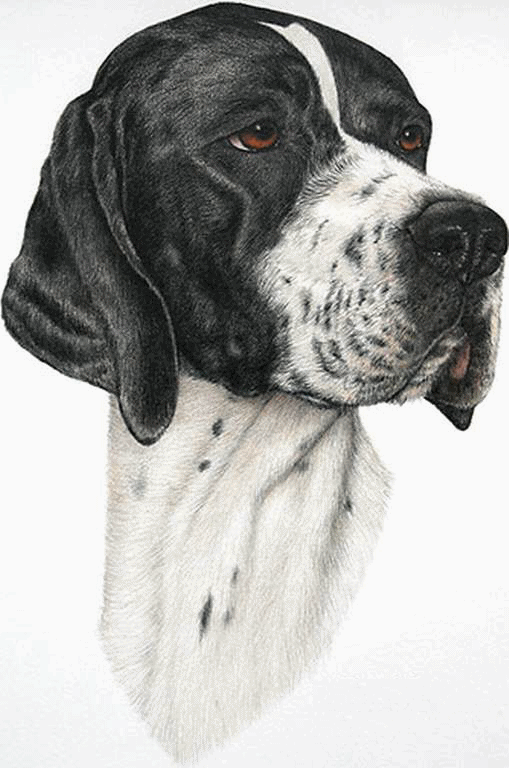 You must always keep in mind that foreground is the hero of your dog embroidery designs. The animal will be in the foreground so your aim should be to make the foreground more striking. The background should have horizontal filling while the foreground must be vertical and angular. You should keep this detail in mind before digitizing your design for machine embroidery. We have been in the digitizing for embroidery industry for the last 15 years and way before the advent of all the new fancy tricks. We know quite well that it all boils down to the choice of using the right type of stitches. The choice of appropriate stitch type and an accurate parameter is pivotal in creating the desired natural looking dog embroidery designs. The digitizer should apply these crucial details to get that eye-catching natural effect. The embroidery digitizer has to consider the following basic instructions regarding various stitch types and their parameters while digitizing a real animal. Always start your design with the underlay to lend stability to your design. 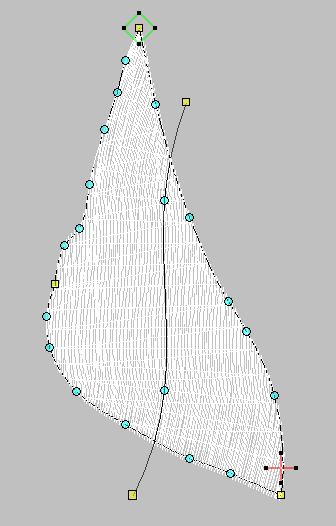 The golden rule is to use light density for smaller designs and a bit denser stitches for the larger ones. But, this rule could have some variation. The larger design might sometimes require the same lighter density. However, you must have clear foundations to avoid any glitches in the design. A clear rule of thumb to digitize an animal is to use a lighter density of underlay than the normal left chest, hat and jacket back designs. So, the initial decisive point is that lighter underlay is a done deal here. Fill stitches also referred to as Tatami stitches are applied to cover large areas. 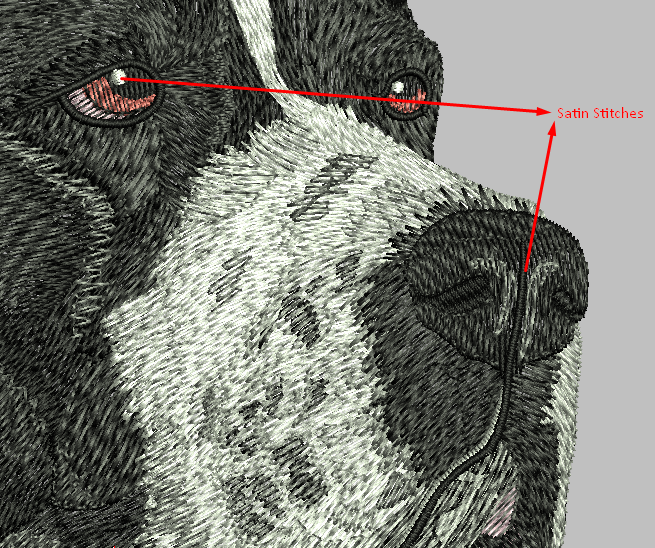 Adjust the stitch length accordingly to enhance muscle details, muzzle, nose, lip, cheeks, ear, and even other minor details. To create the fur effect of the animal use offset fraction accordingly. 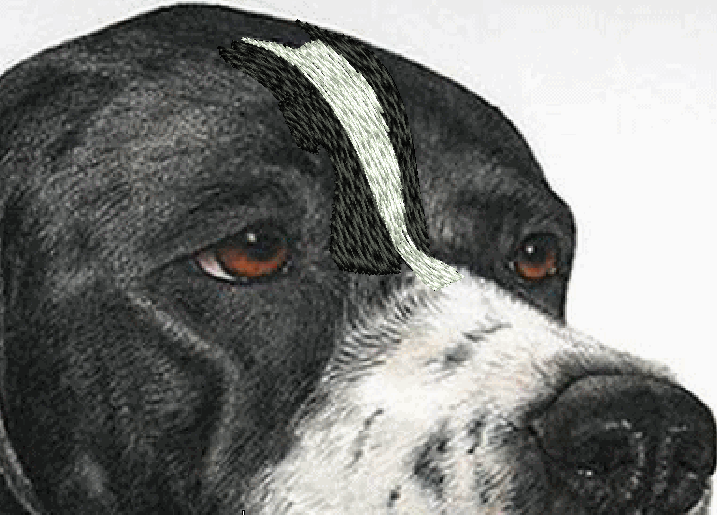 Embroidery digitizing of dog breeds with lesser fur like ‘Besinge’ or ‘Boxer’ need to be set at lower offset fraction. Whereas, the hairy breeds with denser fur, for instance ‘Afghan Hound’ or ‘Siberian Husky’ is set at higher offset fraction and higher stitch length. Ideal recommendation is to remain in the range of 0.5mm to 0.6mm stitch density. Satin stitches sometimes referred as column stitches, are always used for both small and large designs. Satin stitches are used to digitize smaller body parts like teeth, the outline of ear, eyes and the minute detailing work. Always use a light underlay with Satin Stitches. Otherwise, you will end up in a mess, making the design stiffer and breaking your threads and even machine needles. 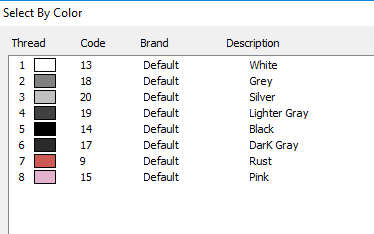 We recommend using somewhere between 0.7mm to 1mm stitch density when making different shades. Let them merge with the layer of stitches beneath them which are the Fill stitches of course. However, there is one sacred rule you must not mess with: Never use an underlay while doing shading. Run stitches also known as Bean stitches are used to digitize the finer, minute and tiny objects like whiskers. The safe stitch length should be kept between 3.5mm to 4mm to obtain a desired natural look. Using proper stitch angles aligned with the image of the animal is the key to success to give it an original actual life like furry look. This step is critical and should be done wisely. 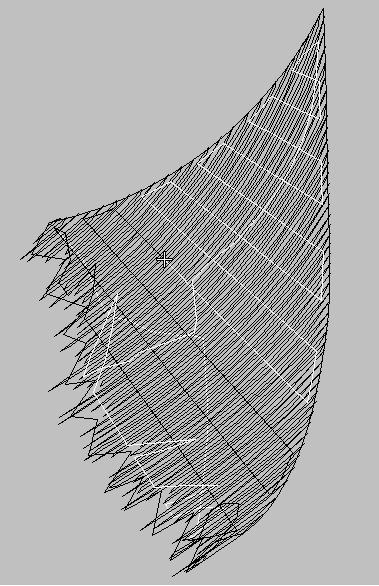 If you create wrong angles, then all of your hard work will go in vain. The focal point is the angle of dog’s hair. Just to give a general example, the angle of hair from nose to forehead of dog goes in a downward direction. The bottom-line here is the more accurate the angle is: the more realistic your dog embroidery designs will be sewn. 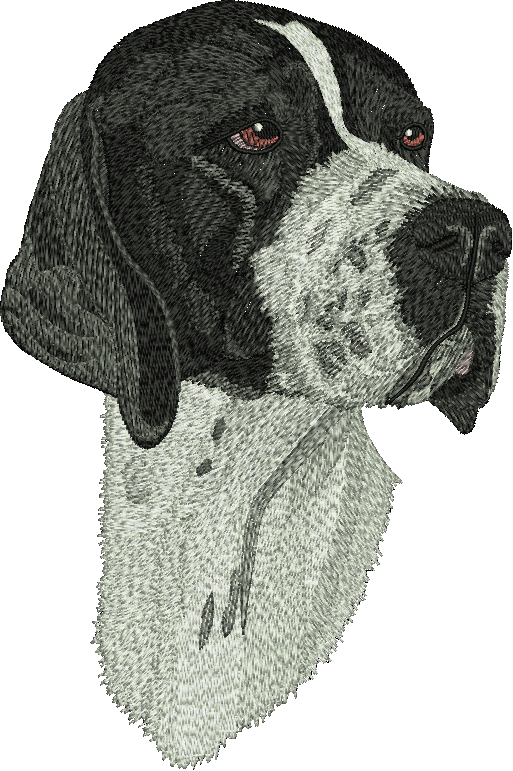 We have kept our promise of educating you about the general as well as technical details for digitizing dogs and creating an accurate and natural look for your custom dog embroidery designs orders. We are sure your next custom dog embroidery project will be a success but don’t forget to share your comments with us. Do not hesitate to contact us if you need digitizing service for embroidery at competitive prices.